Bring Back the Lutheran Potluck! Growing up a Lutheran in the ’70s and ’80s, potluck lunches were the best day of the whole month. Cliché, but true. 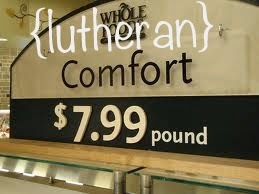 And thanks to Garrison Keilor, even those who didn’t grow up Lutheran know about the Lutheran’s Love of Potlucks. This is most certainly true; no one can put together a table of mismatched food from dozens of different kitchens like the Lutherans. When I left home for college, I met other Lutherans whose childhood highlight was also their churches’ Potluck Sundays. It seems these lunches were the same, no matter if they were at St. Mark Lutheran or at Christ Lutheran of the Mountains. 1. Unusual Food Pairings. A plate of potluck food was both incredibly delicious—and a little disgusting. The Jello/fruit salad mixed right in with the Tater Tot Casserole, making an interesting salty/sweet combo that only tasted good on your potluck plate. 2. Guilt. Lutherans do guilt very well, but a Potluck called for SUPER GUILT. Super Guilt happened when you noticed no one was eating the Green Bean Casserole your mom had brought. You didn’t really have room on your plate for it either. But out of guilt, you scooped some up. If she had to walk out of the church carrying a still-full casserole dish, her shame and your guilt would have been too much to bear. 3. Delicious Fried Chicken. Yes, that bucket was there because some irresponsible soul forgot it was Pot Luck Lunch Day. While the other women were heating up their Tuna Casserole in the kitchen oven, that mom was running over to KFC for a quick chicken bucket. WHO CARES? With any luck, you would get a piece of that extra-crispy goodness before it ran out. 4. Homemade Lasagna. In a Small Dish. This lasagna was tiny because a 102-year-old woman made it from scratch. Within that tiny dish of layered ambrosia was the question: can you take a big piece, even though there’s not enough to go around? 5. A Glorious Dessert Table. Thick slices of chocolate cake, slathered with creamy chocolate frosting. Fudgey Brownies. Chocolate Chip Cookies with more chocolate than cookie. These were the homemade desserts everyone craved. All sliced up and served on little paper plates at potlucks. 6. Sugary Sweet Tea/Lemonade with No Sugar. Maybe this was only in the Deep South, but our potlucks always featured the sweetest sweet tea your pancreas ever met. This tea was like syrup, it was so infused with sugar. Seriously, thirty years later, my teeth are rotting just thinking about it. Conversely, the lemonade? Bug juice. Mostly water with a little Country Time, and even less sugar mixed in. Maybe an Arnold Palmer of the two would have made the perfect potluck drink? 7. Belt-loosening. Forget Thanksgiving Full, eating second and third helpings of potluck food would put you so deep into a food coma, you might never feel hungry again. Until dinner, when you would have to eat the remnants of your mom’s dish that no one finished. 8. Strict You-Take-It, You-Eat-It Rule. Potlucks were different than all-you-can-eat buffets. At those, it seemed okay to dish up a bowl of Cream of Asparagus soup, and when it tasted like moldy tree branches, you were fine to leave it uneaten on your table. Not so for potlucks. You knew the women who woke up at 5 AM to prepare this food. They were probably related to you, or sitting across from you. If you took the tough-as-leather pot roast, you’d better eat it. 9. Fellowship. Potlucks were not only good eating, they were also good fun. During the voters’ meeting that inevitably followed the potluck, the kids could run amuck. Back in the ’80s, before DVD players or iPads, us kids had nothing to do. We found really good uses for our time, like binging on the leftover desserts. Or seeing how long each of us could hold our breath before we passed out. Was it that clamoring mess in the kitchen that led to the potluck’s demise? Too much sugar in the tea causing Type 2 Diabetes that ended potlucks? Maybe so, because it seems the potluck has gone the way of the Red Hymnal. No one does potlucks anymore. If there’s a voters’ meeting after church, congregations want catered food. Is there really no room in today’s world for potlucks? Whole Foods, it seems, is trying to bring back the Potluck Experience. Each store has a Hot Bar, steam tables filled with pot roast and lasagna and beef stew. For the price of $8/pound, you can ladle any of this potluck-style deliciousness onto your plate. Our family goes there a couple times a week for dinner. My kids, Lutheran right down to their DNA, don’t realize why they love the Hot Food Bar. It’s because the love of comfort food mixed onto their plates is in their blood. If someone doesn’t bring back the Potluck soon, the next generation will think the Whole Foods Hot Bar is the real deal. And we’ll only tell legends about tiny pans of lasagna, the buckets of chicken, and Tater Tot Casserole. For all that is good and Lutheran, someone out here, bring back the potluck. I’ll even bring a bucket of chicken. Come on down to Pearland where potlucks, for better or worse, are still going strong every Wednesday during Advent. Love me some chicken noodle soup. Really? This makes me so happy. The Ward children will be the Lutheran Potluck Torchbearers for the next generation. Love it!!! Thanks for making me appreciate out potlucks a little bit more. Oh and you gotta love the big crock pot o mac n cheese for the kids and 20 different versions of pb&j. The Epiphany potlucks even have Crock Pots of mac and cheese? I can’t believe I didn’t know about this! We pagans have potlucks too, but there’s usually a disquieting amount of vegan food polluting the pot roasts and chicken soup offerings.